August 2011 ~ I Can Do That! The August 2011 Daring Bakers' Challenge was hosted by Lisa of Parsley, Sage, Desserts, ad Line Drives and Mandy of What The Fruitcake?!. These two sugar mavens challenged us to make sinfully delicious candies! This was a special challenge for the Daring Bakers because the good folks at http://www.chocoley.com/ offered an amazing prize for the winner of the most creative and delicious candy! I got carried away again with this challenge. It's candies and chocolates! 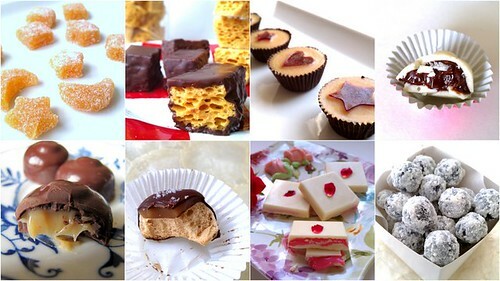 How can I resist making different flavored fillings for chocolate? The last time I made was a simple hot chile infused chocolate candies in February of this year; before that, was in 2009. 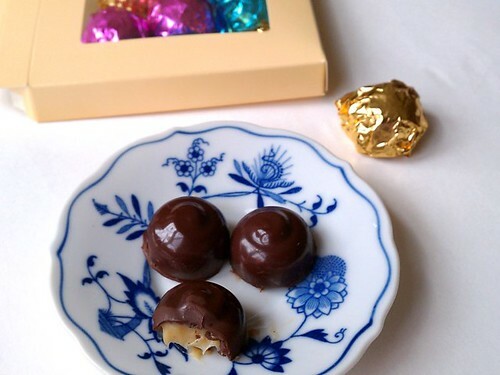 I used to make molded chocolate candies very often since I discovered 12 years ago how much fun it is to make them but I have since moved on to other yummy stuff and set aside my candy making activities. Thank you Mandy and Lisa for reviving my enthusiasm for making chocolate and fruit candies at home. The recipes provided by Lisa and Mandy and how to temper chocolate are here. It's always a treat to nibble on these tiny fruity gems. This is my current favorite. The peanut butter is very creamy and I love the chewiness of the orange flavored wine jelly. I used dark chocolate for these. 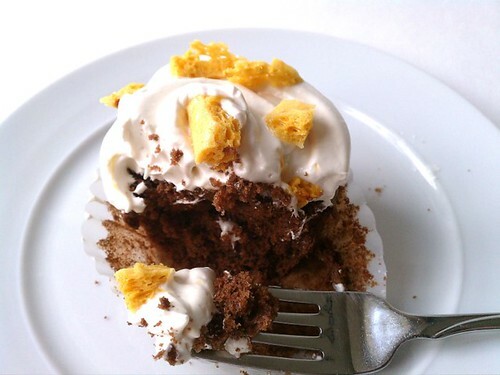 Prepare the chocolate cups: Brush cups with chocolate. Turn upside down to remove excess chocolate and turn back up and leave on the kitchen counter or refrigerator to set. Prepare the peanut butter cream: Heat cream in a double boiler; add chocolate and let melt completely. Add peanut butter and salt and stir gently until fully incorporated. Let cool for 10 minutes then transfer into a disposable piping bag; set aside. 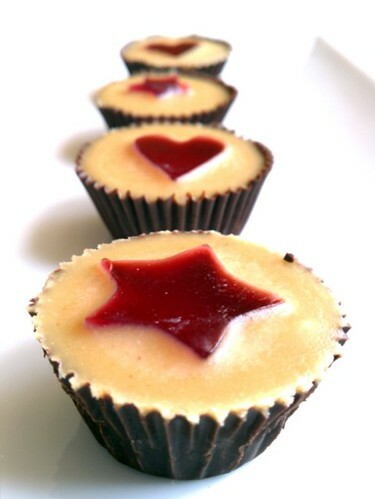 Prepare the jelly: Place wine or juice and pectin in a medium sauce pan and whisk to combine. Heat to rolling boil then stir in sugar. Cook for 1 minute. Transfer into an 8 x 8 inch square pan lined with foil. Leave on the kitchen counter or refrigerator to set. When firm, cut into shapes with small cookie or fondant cutters. Fill the chocolate cups: Cut the tip of piping bag and pipe peanut cream 2/3 full. Press jelly on top of peanut cream until embedded but still visible. Refrigerate until set. To serve: Peel off tin foil cups and transfer into a serving plate. The ganache is tart and sweet and best with sweet white chocolate. 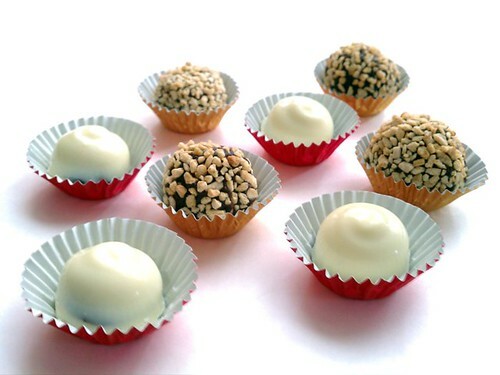 I found a bag of malted milk crisps at the candy supply store and used the bits to cover the soft ganache balls. They add very little sweetness but I like the malted milk flavor. Make the ganache: In a double boiler, heat the cream; Add the chocolate and butter and heat until melted, stirring to combine. Add honey and pomegranate molasses and gently stir. Transfer half into a container and let set in the refrigerator. Leave the other half on the kitchen counter. 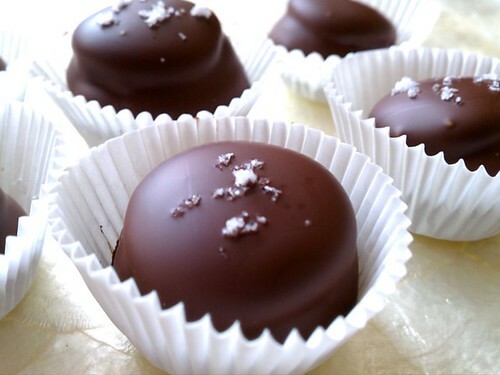 Coat the ganache balls: Pour tempered chocolate on round candy molds and place in the freezer for a few minutes. Fill with room temperature ganache just below the rims of the mold cavities, put back in the freezer for a few minutes, then cover bottom with tempered chocolate. Refrigerate for 30 minutes. 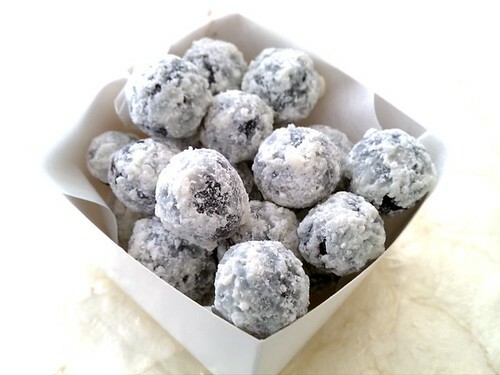 Form the chilled ganache into 1 inch balls; roll in malted milk crisps and refrigerate until firm. 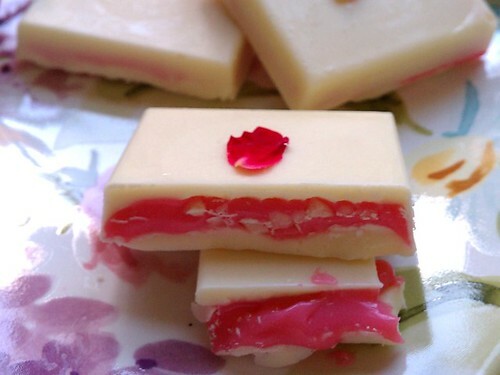 To serve: Unmold white chocolate candies and trim edges if necessary. Transfer both chocolates into paper cups and serve. Refrigerate leftovers. Crack or pound cinnamon stick, cloves, black peppercorns, and cardamom seeds. In a small pan, heat cream over medium heat and add the leaves and spices. Cover pan and simmer over lowest heat for 15 minutes. Turn heat off and let steep for another 15 minutes. Strain though a fine sieve into a glass bowl and set on top of a pan of low simmering water (or double boiler). When heated through, add white chocolate, a handful at a time, stirring until melted. Cool to room temperature. Fill chocolate molds and leave in the refrigerator until set. Unmold, cover in foil wrappers or set on paper cups. I love these tiny buttons. They are all at once crunchy, chewy, and chocolaty. Very addicting! Cookies: Preheat oven to 300° F. In the bowl of a standing mixer with wire whisk attachment, beat egg whites and cream of tartar until foamy. Gradually add brown sugar and beat until stiff and glossy. Beat in vanlla extract. Transfer meringue into a piping bag; snip a ¼ inch opening and pipe 1-inch rounds 1 inch apart on parchment-lined sheet pans. With slightly wet fingers, flatten top of cookies. Bake until golden brown and dry to the touch, about 20 minutes. Turn heat off and leave in the oven for another 20 minutes. Remove parchment papers from sheet pans; gently remove cookies from paper. 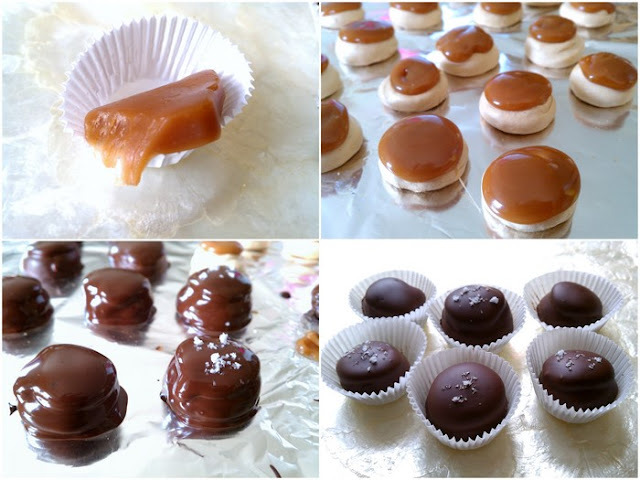 Caramel: Transfer into a piping bag and pipe a teaspoon on top of each cookie. Dip cookies in tempered chocolate. Sprinkle a few grains of flaked sea salt, if desired. Leave on the kitchen counter until chocolate coating is set. The fondant is soft that it oozes out when I bite into it. Prepare molds, preferably shallow, with tempered chocolate; refrigerate while preparing fondant. In a double boiler, heat cream and add chocolate. Stir until chocolate is completely melted. Stir in rosewater and food dye. Transfer into a piping bag; snip a small hole and pipe a thin layer on top of chocolate. Cover with chocolate. Refrigerate until completely set. Unmold and garnish tops with rose petals using a small amount of melted chocolate. 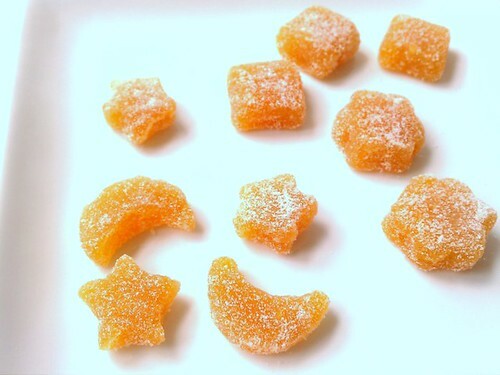 The recipe for these sweet fruit candies comes from Michel Richard, a Washington D.C. restaurateur and chef. I was watching a local TV show featuring Washington, D.C. restaurants and when I saw him preparing the candies I thought I should share it because the fruit candy is so simple to make yet really delicious and satisfying. Place grapes in a large bowl. Pour a little of the tempered chocolate while constantly stirring the grapes. Pour enough chocolate to cover the grapes, still constantly stirring until chocolate has almost set. Sift icing sugar all over while constantly stirring grapes, making sure they don't stick together, until completely set and dry to the touch. Transfer into a serving bowl or plate. It's starting to get cold in the early morning and I'm trying to enjoy watermelon these last few weeks of summer. 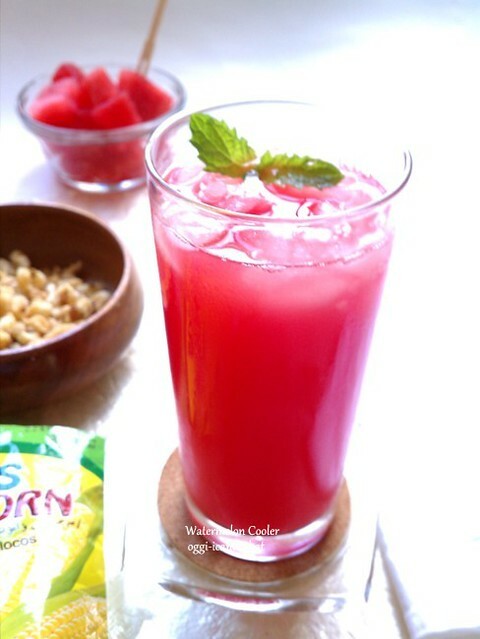 I usually prefer just taking large bites of chilled watermelon slices or pre-cut into large chunks but steeping lemon rinds and mint leaves in watermelon juice for several hours in the refrigerator makes a really cool watermelon drink. I don't add sugar or honey to the clear juice which I prepare by blending chunks in the blender and straining the pulp over a fine mesh lined with coffee filter. I fill a glass with a little crushed ice, then add 1/3 part soda, seltzer, or sparkling water [or lambanog/vodka] to 2/3 part clear juice. It's so refreshing, a little minty with just a hint of lemon. Place a sieve over a bowl; line sieve with round coffee filter. Blend watermelon in a blender. Pour into the lined sieve. Discard pulp. Place mint in a quart Mason jar. Bruise mint leaves with a wooden spoon. Add the lemon zest and the watermelon juice. Chill in the refrigerator for 4 hours. To serve: In a tall glass, add a quarter full of crushed ice. Stir in watermelon juice and a quarter cup of Perrier. Garnish with mint leaves or lemon slice. 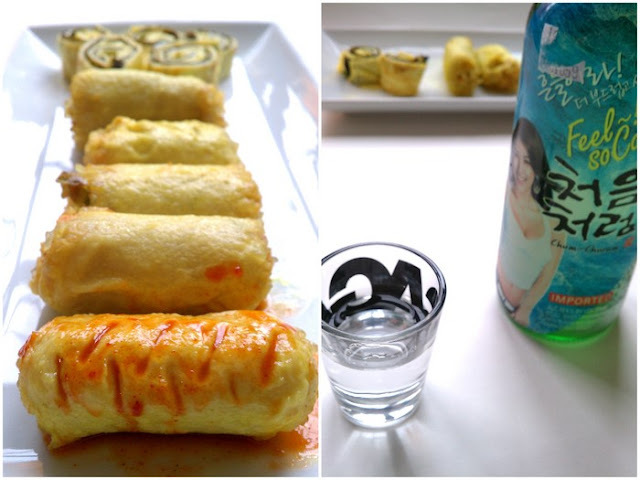 I've always loved Korean food; I cook it as often as I could. 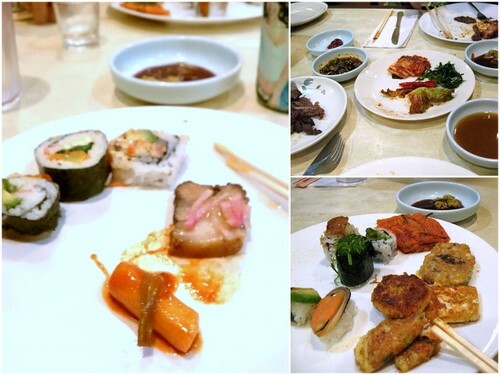 When my family and I lived in Hong Kong in the late 80s, we used to go to Korean restaurants on Sundays but haven't been to one that serves authentic Korean food for many years now because they are too far from our house. Yesterday, we drove to the nearest and had buffet lunch but I was only able to take a few blurry photos to be able to concentrate on the great food. I'm also loving their movies and TV dramas too. A few years ago I started getting hooked on Korean movies and very recently Korean TV dramas AKA Kdramas. Although I've watched Korean, Chinese period series, and Japanese dramas more than 22 years ago, I barely understood what was going on because of the lack of English subtitles [but I still watched them]. When I saw the first episode of my first Kdrama, Boys Over Flowers, streamed from Netflix, I didn't know I was going to be addicted. Boys Over Flowers has 25 hour-long episodes which I finished in 3 days, that's over 8 hours a night of marathon viewing, but I can't seem to stop clicking on the next episode once the previous one ended. I have since watched 6 more Kdramas, plus the earlier Japanese Boys Over Flowers version and its full-length movie for a total of approximately 140 hours of TV and laptop viewing in 5 weeks, my eyeballs are hurting already. All the Korean F4 boys are so cute, but I love the "leader", Gu Jun Pyo, croissant hair and all, played by Lee Min-ho. Move over, Asano Tadanobu, Sakaguchi Tak, and Kaneshiro Takeshi, I have a new flavor of the year, Lee Minho. Luna Miranda's Food Friday entry last Friday inspired me to make batchoy which I haven't had for over 20 years and this is the first time I made the dish. 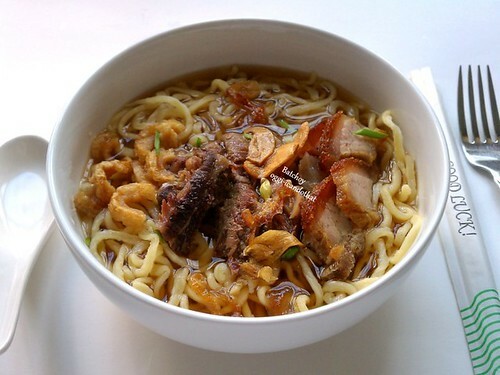 I topped the egg noodle soup with strips of precooked beef, pork, chicharron, lechon kawali, fried shallots, fried garlic, chopped chives, and calamansi juice. Sarap! In a medium saucepan, heat the oil and saute garlic and onion over medium heat. Add stock, add salt if necessary, and let simmer on low heat until ready to use. Boil water in another saucepan and cook egg noodles. Portion noodles in individual bowls, top with desired toppings except calamansi, ladle hot stock to cover, and serve immediately with calamansi or lemon juice. 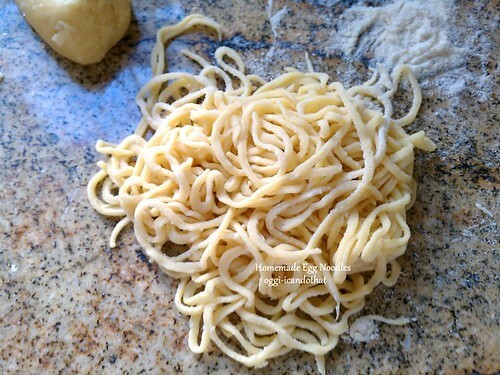 If you cannot find fresh miki (fat-ish egg noodles), it's easy to make and you don't really need a pasta machine although it helps a lot if you have one. In a medium bowl, whisk together flour, baking soda, and salt. Add eggs and oil and mix with a wooden spoon until combined. Transfer on kitchen counter and knead a few times until soft and smooth. Cover with plastic wrap and let rest for 20 minutes. Divide into 4 portions. Roll one portion into a 1/8-inch thick rectangle, about 16 inches long, dusting with flour if sticky. With a pizza cutter, cut into ¼ inch strips. Dust with flour to separate strips. Cook immediately or place on a lightly floured sheet pan while rolling and slicing the rest of the dough. While browsing one of my Filipino cookbooks, RECIPES OF THE PHILIPPINES, compiled by Enriqueta David-Perez, I found these unfamiliar small cakes called Capuchinos. 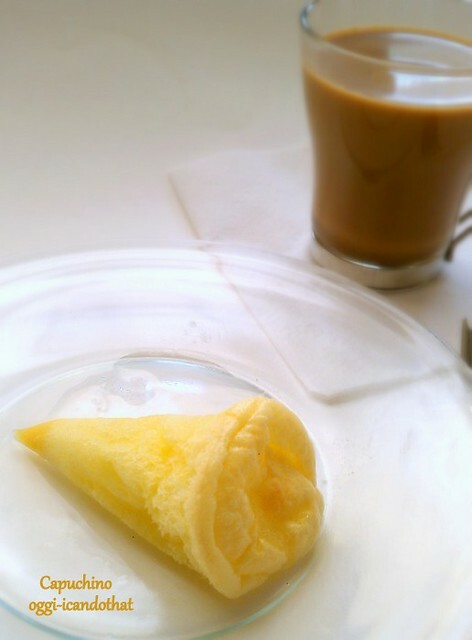 I have never heard of these tiny airy cakes made with lots of eggs. The cakes which are Spanish in origin are dipped for half a second in thin syrup before serving. I thought at first that they are coffee flavored because of the name. Researching online for its origin was frustrating. Entries for the cakes are scarce but I was able to find one or two articles and a recipe from a Miami (Cuban) restaurant. Both the cakes and capuccino coffee come from the Capuchin monk's habit; capuchino cakes from the pointed cowls and the coffee, its dark brown color and also the pointed cowl. The recipe from the Filipino cookbook has flour, butter, sugar, and brandy and they are baked in small muffin cups which in my opinion is similar to chiffon cake or mamonalthough it has baking powder; the one from Miami has very little sugar and cornstarch added to the batter. I chose to make the one from Miami because I love airy light cakes. 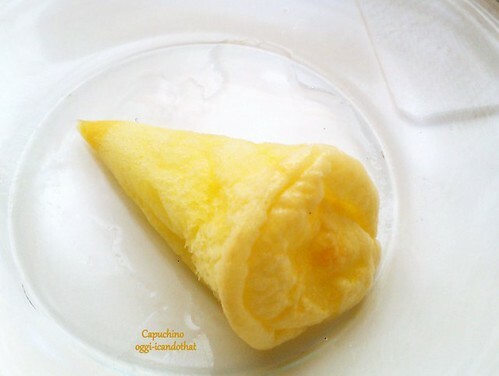 I made cones out of parchment paper and baked them on ice cream cone servers but these can be baked in lined muffin cups. Cakes: Pre-heat oven to 350°F. Beat egg yolks and sugar for 15 minutes until thick. Sift cornstarch over egg mixture and gently fold until mixed. Transfer into a pastry bag, snip the tip of the bag and fill paper cones or paper liners 2/3 full. Bake for about 12 minutes or until tops are rounded and golden.When done, peel off the paper cones and pour syrup over them. Syrup: Put sugar, water, lemon peel, and¼ teaspoon lemon juice to a boil. Boil for 3 minutes. Add brandy and vanilla. Cool completely before using. Here is the recipe in its entirety from RECIPES OF THE PHILIPPINES. Beat the eggs and sugar well. Add the melted fat then add the dry ingredients. Add brandy. Place in greased muffin pans and bake in hot oven. Before serving, dip in thin syrup for half a second. Set in a cool place to dry. Thanks Mary for challenging us to cook South Indian food. I rarely cook Indian food and never liked it in the past but in recent years, I have come to appreciate it and even bought a cookbook. 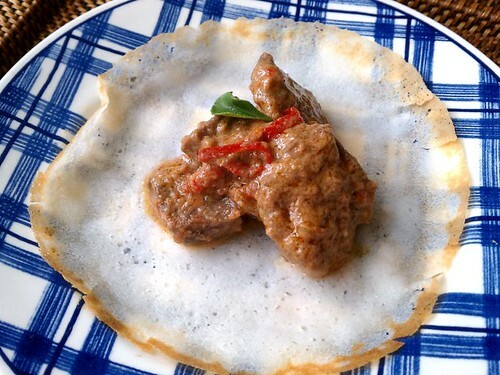 I have cooked Kerala Chicken once and loved it but this is the first time I have heard of appam, a flat bread made with fermented rice paste and coconut milk and cooked in a small wok or skillet. 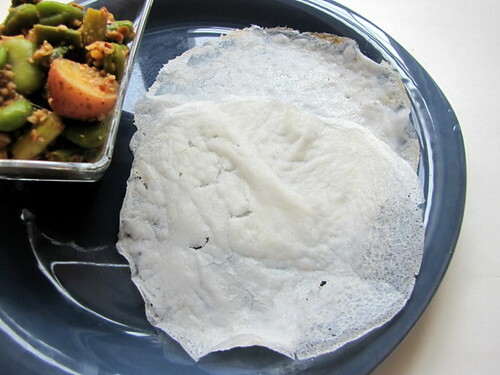 The recipe for appam and dishes are here. 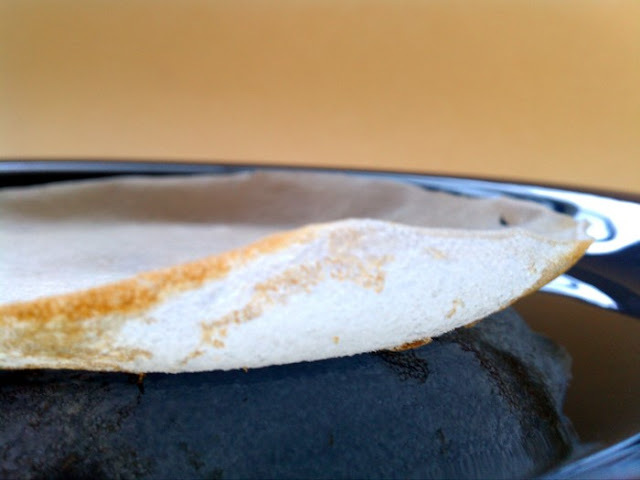 Initially, I didn't like its fermented flavor but the second batch I made which had less yeast and shorter fermentation period made delicious appams. 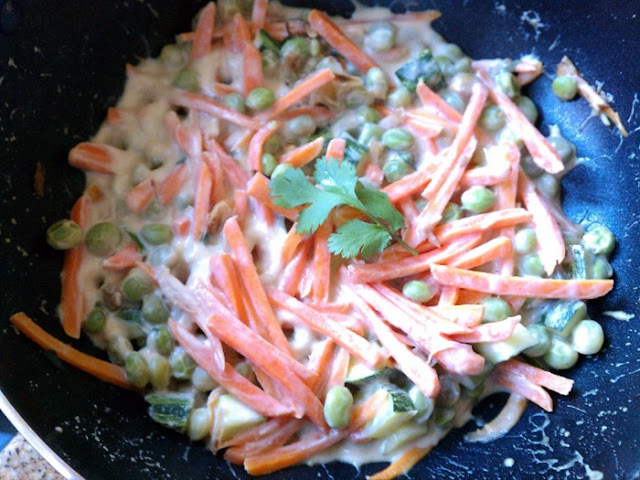 I prepared a simple but yummy vegan dish to go with them, the recipe I adapted from here. In a small skillet, toast separately coconut, lentils, and chile. Put them in a blender together with the toasted sesame seeds and blend to a paste, adding a little water if needed. 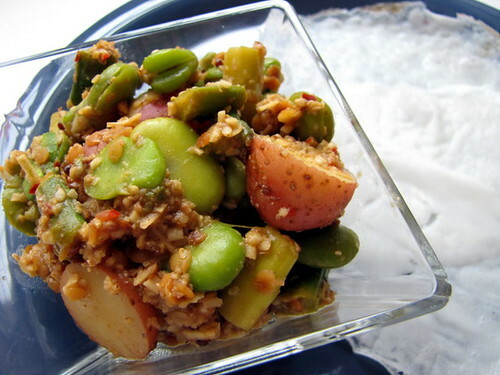 Place the blended mixture in a large skillet or small wok and saute for 3 to 4 minutes. Add the vegetables, tamarind paste, salt, and water; let boil, lower heat to medium low and simmer, covered, until potatoes and beans are tender and asparagus still crisp but tender. In another skillet, heat the oil and saute mustard seeds, dried chile, and garlic for 2 minutes. Add the curry leaves and sugar and cook for 1 minute. Stir into the vegetables; turn heat off and let rest for 10 minutes before serving with warm appams. I also cooked the Sri Lankan Beef Curry provided by Mary but replaced the green chiles with hot reds. 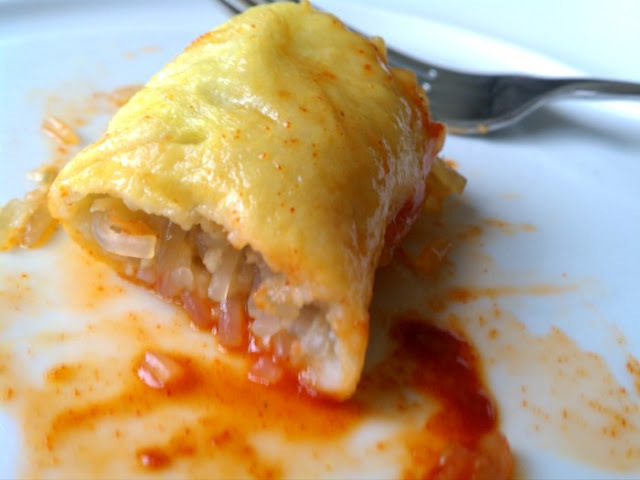 Do try this delicious dish. And for breakfast the other day, I added 4 tablespoons sugar to 1 cup of batter, and cooked them thicker than regular appams.. 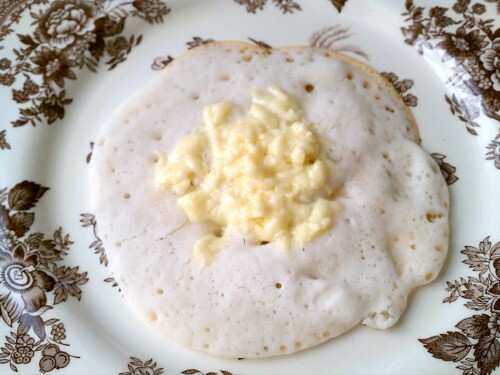 I added grated sharp cheddar on top for a sweet, salty, and coconut-y rice pancakes. I love it! 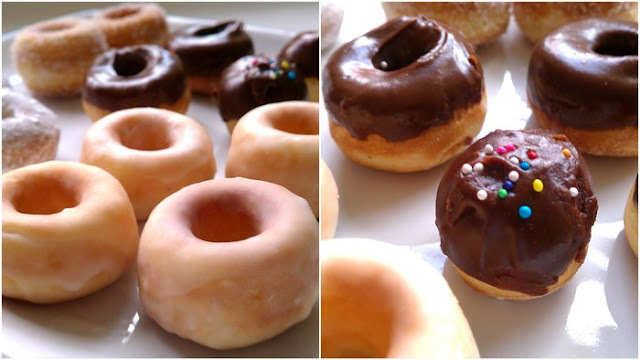 These 1½-inch baked yeast mini donuts and holes are delicious glazed, rolled in regular and icing sugars, or topped with chocolate frosting. They are a tad crispy and chewy, not as fluffy and soft like Krispy Kreme. All the recipes for the mini donut pan are baking powder cake donuts but I prefer using yeast for donuts. I just followed a recipe for regular donuts, cut the dough with donut hole cutter, then pressed them on the mini donut pan cavities. These are so cute, fun to eat, and satisfy my donut craving with just a few pieces. Whisk together flour, yeast, sugar, nutmeg, and salt in the bowl of a standing mixer. Add the rest of ingredients and mix with paddle attachment until combined. Knead on medium high with dough hook attachment until smooth and elastic. Transfer into a lightly greased container, cover with plastic wrap, and let ferment until doubled. Knead lightly; roll into ½ inch thick rectangle. 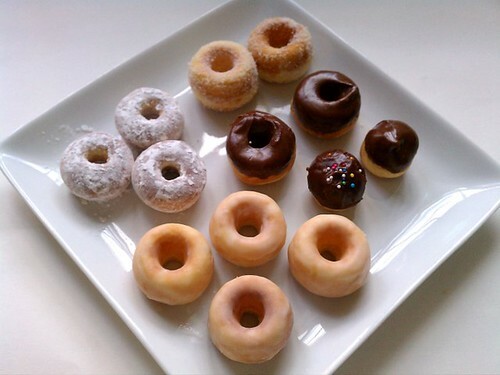 Cut with donut hole cutter or 1-inch round cookie cutter. Press into the cavities of a mini donut pan until the dough goes through the middle creating a hole. Cover with plastic wrap and let rise for 30 to 40 minutes. Bake in a preheated 400° F oven for 12 minutes or until golden. Remove from pan and glaze or roll in powdered sugar if desired. 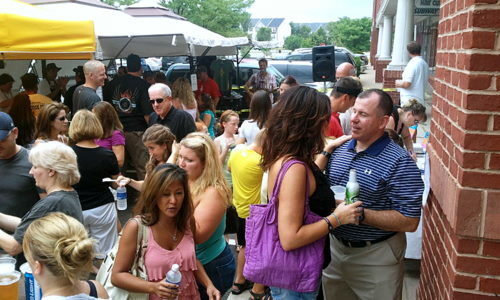 I went to a chili cook-off sponsored by our local Ashburn Pub last Saturday. 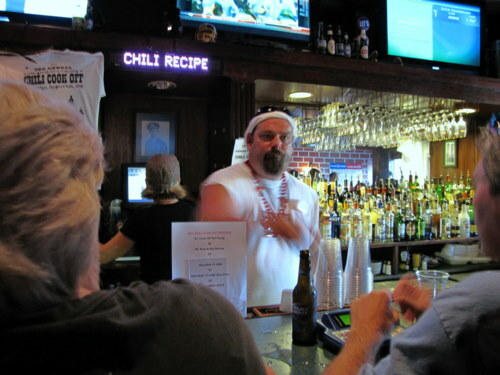 17 chili recipes entered the competition and the winner by popular votes from us tasters will have their chili recipe included in the pub's menu for a whole year. I tried only 7 chilis, 6 without beans and 1 with beans and sweet corn. The first one I tried was terribly sweet, I tasted only a tiny portion and threw the rest away. 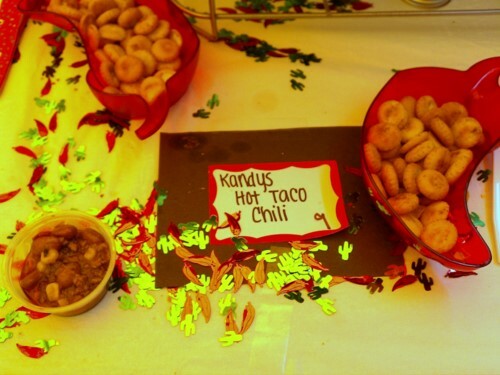 Who puts sugar in their chili and who would eat and love it??? 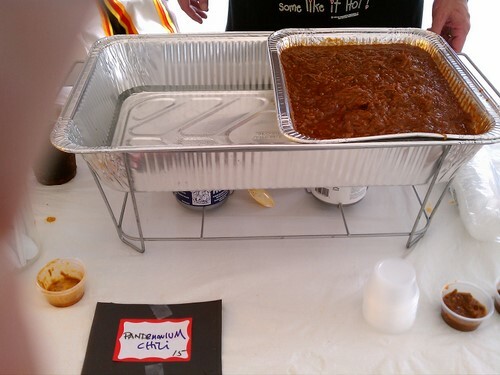 Well, as it turned out people here in Ashburn like their chili sweet and honeyed because it WON the competition. 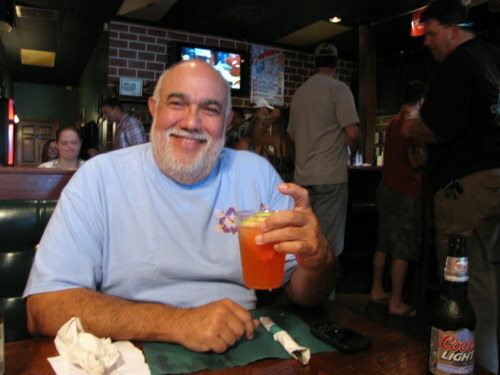 A friend of ours, Enrique who is originally from Venezuela, voted for it as the best, so what do I know. 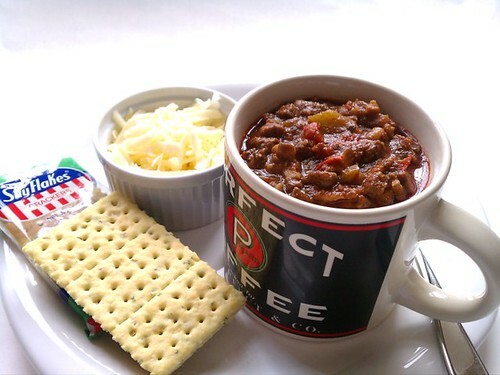 Anyway, the only chili I make and eat is Authentic Texas Border Chili and nothing else. Enrique with his drink Mongo Juice which he gave to me because it was too sweet for him. It's a non-alcoholic drink that tastes of nothing but chemicals, sugar, and probably a few drops of bitters. I drank it because it was cold and I liked the large slice of watermelon. 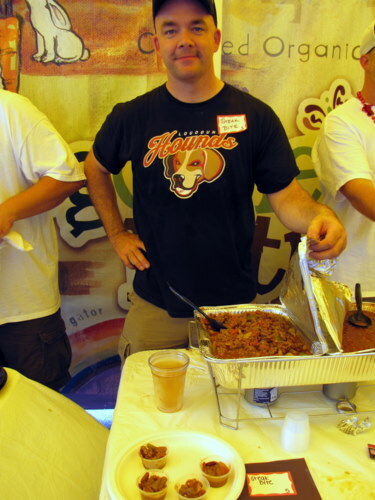 Our friend Enrique suggested I join next year and he will "pimp" for my chili but now that I know what the tasters prefer, my chili might come out at the very bottom because it's never sweet and has loads of spices. It's been ages since I made chocolate cupcakes. 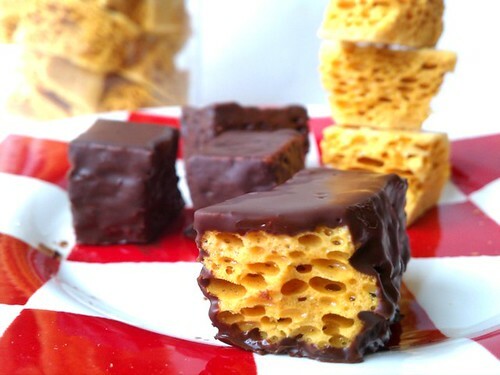 I have small bits of sponge candy, also called honeycomb because of its open fluffy texture, and thought they would be great as topping for chocolate cupcakes. I wasn't in the mood for the too rich dark ones so I used natural cocoa powder for lighter but still chocolaty cakes. 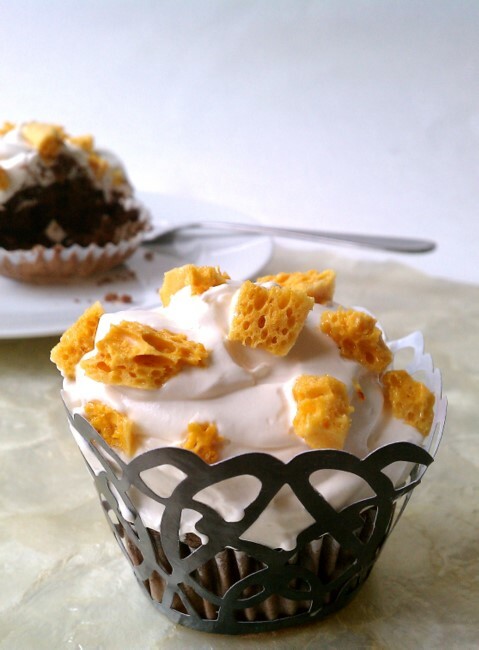 I love the crunch and extra sweetness of the sponge candy, perfect with the soft melt-in-your mouth cupcakes. If you prefer really dark moist rich cakes the recipe is here. Line cupcake tins with baking papers. In a medium bowl, whisk together flour, cocoa powder, baking powder, and baking soda; set aside. In the bowl of a standing mixer with the paddle attachment, beat butter for 1 minute; add sugar and vanilla and beat on high until light and fluffy. Add egg yolks, one at a time, beating each time until just incorporated. Add flour mixture alternately with water, beating until smooth. Transfer mixture into a bowl; set aside. Wash the bowl thoroughly. With wire whisk, beat egg whites until stiff and glossy. Mix a little of the egg whites into the flour mixture to lighten. Fold the rest of the egg whites into the flour mixture. Spoon about ¼ cup of dough into each cup. Bake for 15 to 20 minutes or until cake test is done. Cool completely before frosting. In a small bowl, heat sugar and water until sugar dissolves. Bring to a boil until bubbly; turn heat off. In the bowl of a standing mixer with wire beater, beat egg whites and cream of tartar to soft peaks; slowly add hot syrup while beating on high speed until frosting is thick and satiny.